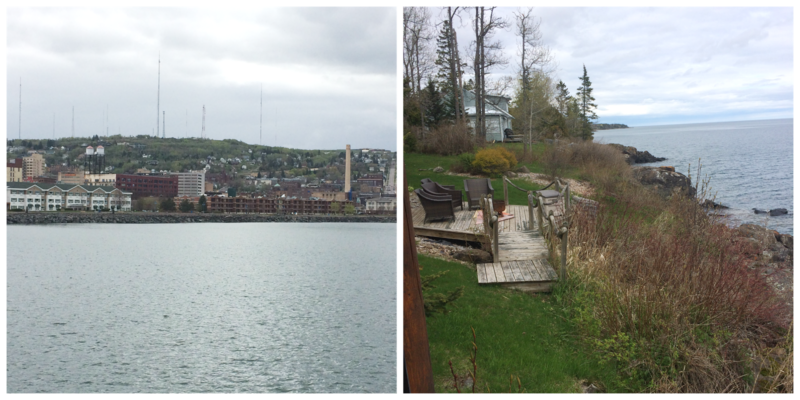 MN turned 30 on May 22nd so we headed to Duluth, Minnesota from May 21-23 for a mini vacation to celebrate. 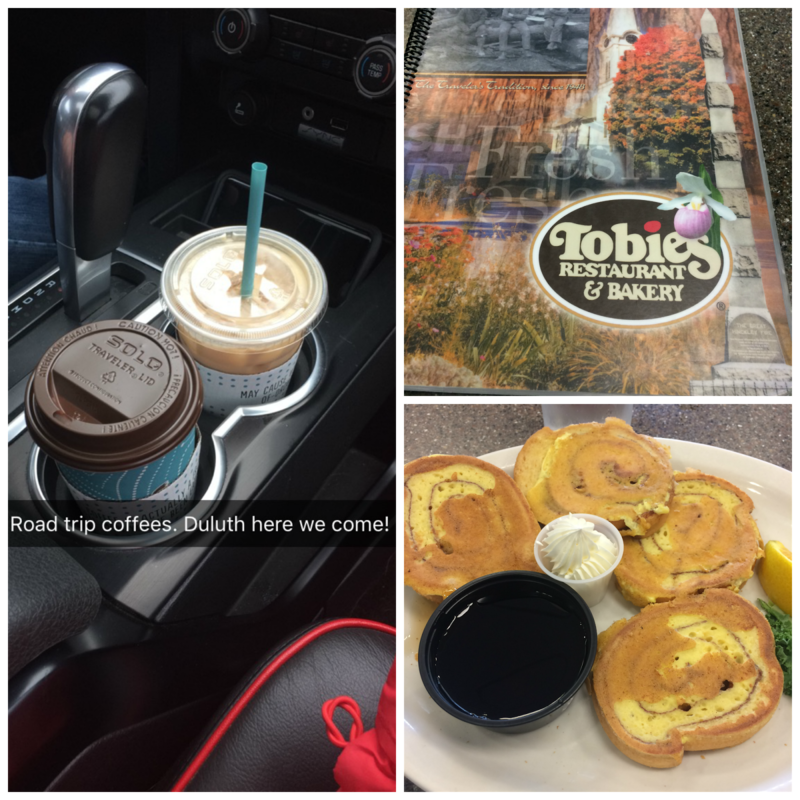 Our first trip together was to Duluth last July (which I don't think I ever recapped so that's now on my to do list) and I fell in love with the area so I had been counting down to the trip for a looooong time. It was definitely a different experience going from visiting in the middle of Summer to the middle of May though - quite the temperature difference but still a great vacation! We got up bright and early and left for Duluth on the Sunday before MN's birthday. Our first stop was at the Caribou Coffee just down the street from MN's place to get road trip coffees and then we were finally off on our mini vacation. Duluth is about 2 hours and 15 minutes from St. Paul but goes a lot quicker than any road trip I take around home because it's double lane all the way up there (hallelujah!). Just over an hour into our drive we stopped in Hinckley at Tobies Restaurant & Bakery - a must for a road trip up to Duluth. We had breakfast and also snagged some cinnamon rolls to take with us to have for breakfast at our cabin the next morning. After that we were back on the road to finish our drive to Duluth. Once we got to Duluth we had a couple of hours to kill before we could check into our cabin. We had wanted to hit up some breweries while in Duluth and they were going to be closed on the Monday so it worked out perfect to do that while we waited to be able to check in. It was also overcast and raining off and on so spending time outside would've been pretty chilly so indoor activities was definitely appreciated. 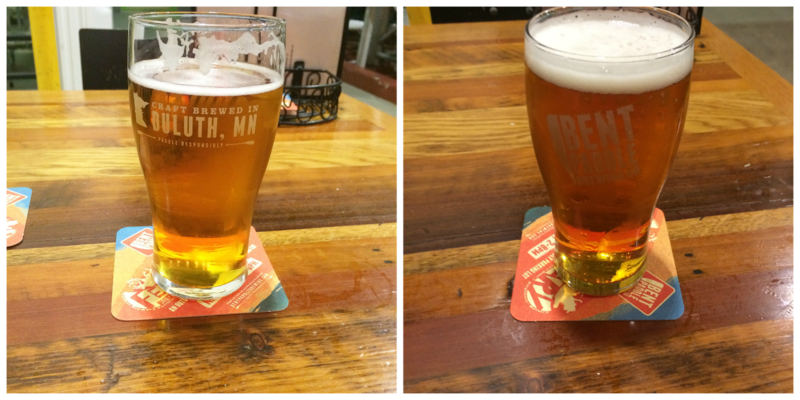 The first brewery we stopped at was the Bent Paddle Brewing Co right in Duluth. I didn't make the best beer selection and I had to force it down, but I'm sure there were others that I would've liked more, I just picked the wrong one (I think I picked the Kanu but don't quote me on that). I've always liked beer but only since I started dating MN have I actually got into craft beers so I'm just finding what I like/don't like (nothing super hoppy! blech). 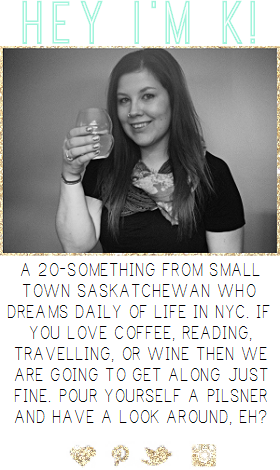 I'm used to drinking domestic beers - Pilsner (aka Saskatchewan Champagne), Bud Light, Miller Lite, etc. - so it's a learning curve for what I like and what I despise. Going to the Beer Dabbler in February I got to try SO many different beers and there were some I LOVED and some that I had to make MN drink because I couldn't even take another sip after the first one. 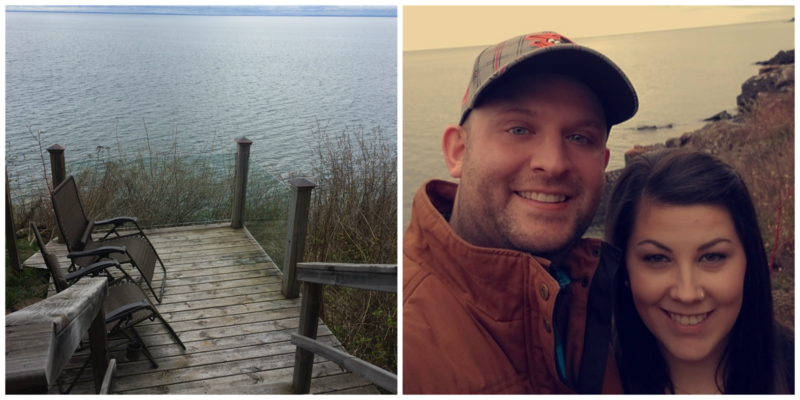 After we finished at Bent Paddle we headed to Twin Harbors (it was so hard not to spell that 'harbour' ha), about a 35 minute drive from Duluth, to Castle Danger Brewing. This brewery had a stack of games to choose from so MN picked cribbage and taught me how to play! I used to 'play' cribbage with my cousins at my grandparents house when I was young but we didn't know the rules and made up our own so it was my first time actually playing. It took awhile to get the hang of it but I actually really enjoyed it (I'm sure he'll have to re-teach me everything again the next time we play though). I can't remember which beer I had at Castle Danger - I want to say the Summer Crush but, again, don't quote me on that. It wasn't my favourite beer I've ever had but it was more enjoyable than the one from Bent Paddle and went down a lot quicker. 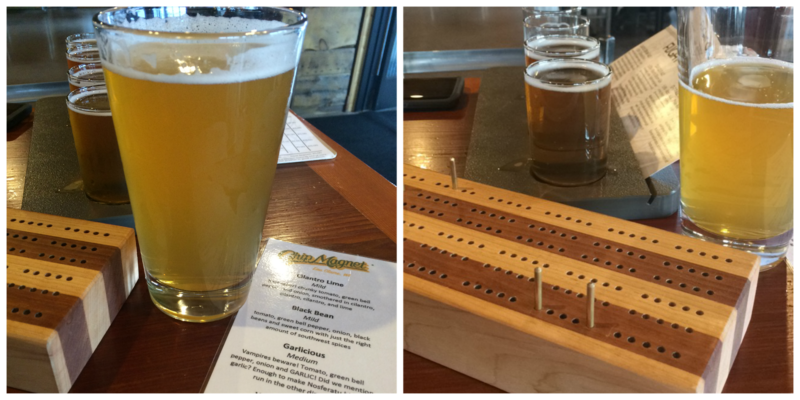 Once we finished up a couple of rounds of cribbage and finished our beers it was time to head back down the road to check in to our cabin. 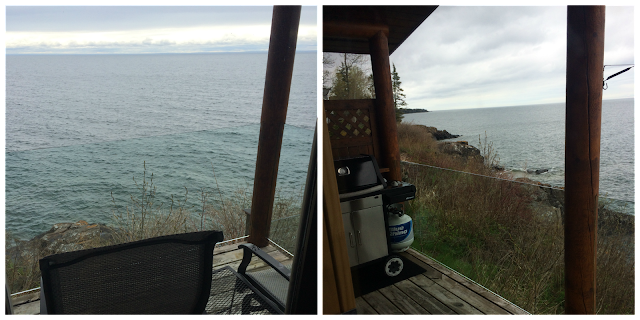 We didn't stay right in Duluth this time and instead stayed at Dodges Log Lodges, about a 25 minute drive from Duluth. There are six different cabins to choose from and they are all SO adorable and I absolutely loved the one we stayed in, the Fitzgerald cabin. It was a completely different environment from the penthouse suite we stayed in at Beacon Pointe Resort during our first trip to Duluth in July 2016 but just as enjoyable. Lake Superior was just steps from our cabin and waking up to the sound of the water crashing on the shore is something I'll never forget! We settled into the cabin and then just spent a couple of hours relaxing (and napping haha). We had celebrated all the family birthdays on MN's dad's side of the family (for a small family - in comparison to mine - there sure were a lot of birthdays for them in May!) on Saturday night with supper and gift opening at his parents house and from his sister and her bf he had gotten a bottle of vodka from the distillery we had visited at the beginning of the month, and all the supplies to make Moscow Minnesota Mules, including some copper mugs, so MN made us some mules to enjoy as we relaxed at the cabin. 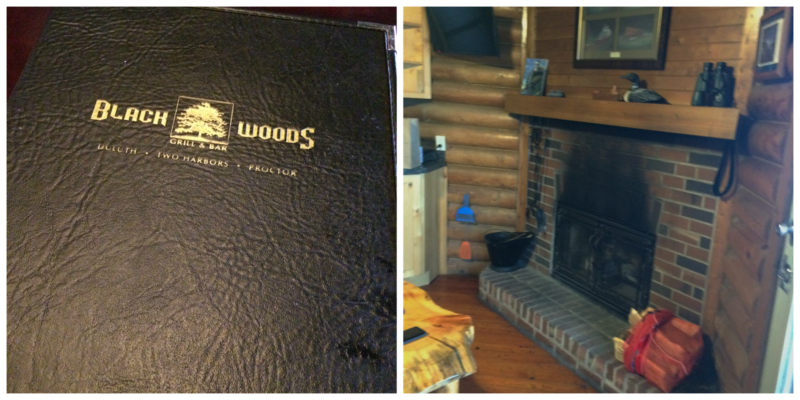 Later that night we headed into Duluth to Blackwoods Grill & Bar for a late supper. Once we got back to the cabin MN built a fire in the fireplace and we watched HGTV (he must really love me haha) before calling it a day. The next morning was MN's 30th birthday! 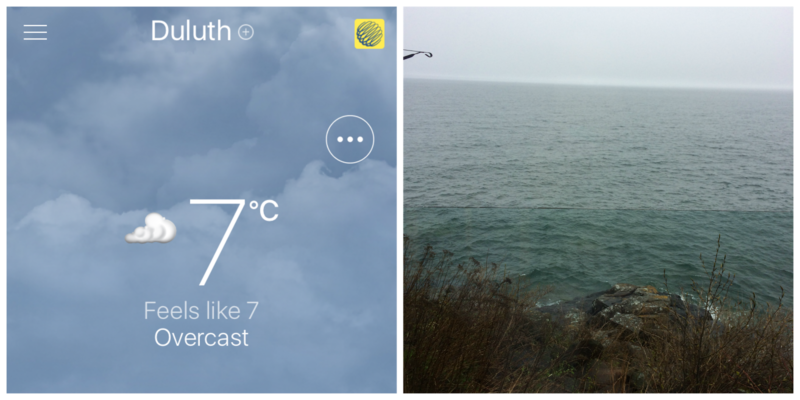 (I'm so glad he hit that milestone before me haha).We woke up to another overcast day, to the sound of the water crashing on the shore and it was just perfect. We had a bit of a lazy morning - we had brought coffee and creamer from home to make in the coffee maker (the best part about staying in a cabin is having a fridge, coffee maker, etc. all right there!) 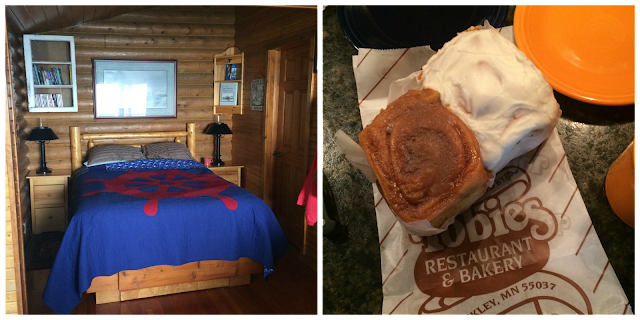 so we enjoyed a few cups of coffee while watching more HGTV and eating our Tobie's cinnamon rolls. 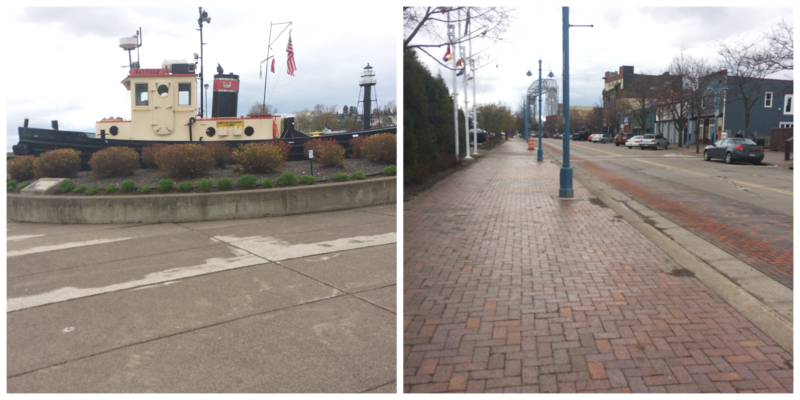 We took our time getting ready and in the early afternoon we headed into Duluth. 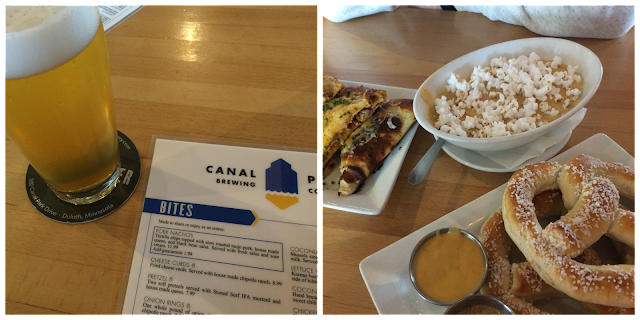 We wandered around the shops for awhile and then headed to Canal Park Brewery for drinks and lunch. I had the Ankle Deep Pilsner and it's my absolute favourite of all the beers I've tried so far (I love me a pilsner). We ordered some appetizers to share and MN also had the Beer Cheese Soup - it was all so delish! After our lunch we walked down to the lighthouse at the end of the lakewalk to see some of Duluth from there and get some pictures. We headed back to the cabin for a bit for an afternoon nap (we're not young anymore ha) and to just relax some more before heading back in to Duluth for MN's birthday supper. We relaxed, enjoyed our nap, and then got ready to head back into Duluth for another late supper. We went to Bellisio's Italian Restaurant and we will definitely go back again, it was SO good y'all. There were walls upon walls of wine racks full of wine - it was very impressive. 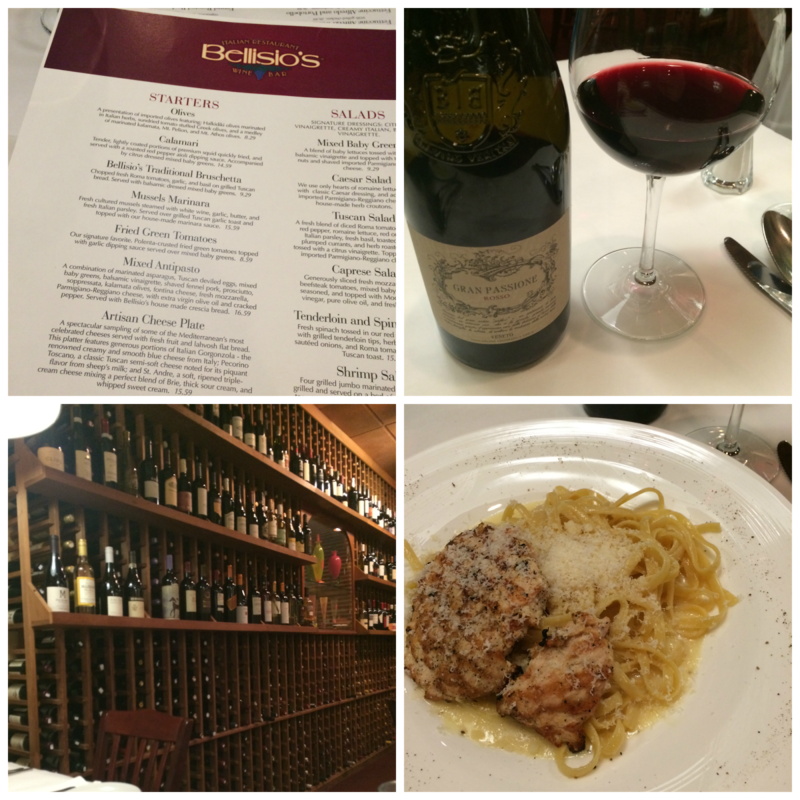 MN got our waitress to recommend a good wine that we would both like (he likes red and I prefer a sweet red or white) and her recommendation was perfect - we both really enjoyed it. Our food was delicious and we even got some free gelato for MN's birthday! I would love to go again during the Summer and sit on their patio - it's definitely on the list for our next visit back. After supper we headed to the Vikre Distillery to continue the birthday celebrations. 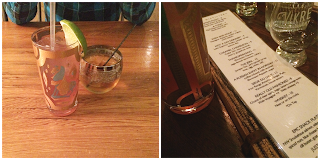 I was able to cross another thing off of my Spring Bucket List by trying a new cocktail - the Not a Gin Drinker. It was so good, I cannot wait to go back and try it again. 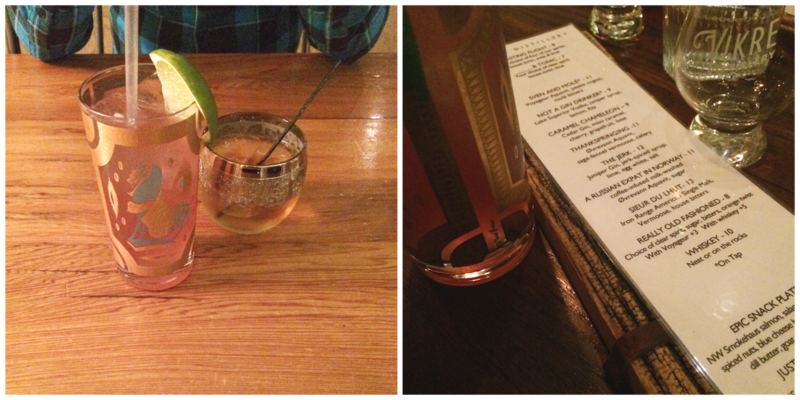 We stayed at the distillery until closing and then headed back to the cabin for our last night. We had plans with friends on Tuesday night to go to the Blue Door for supper and trivia (I still have to finish my May Happenings post - I'm terrible -so more on that in that post) so we wanted to get back to the cities at a decent hour so we packed up early the next morning and were on the road by (I think) 10 am to head back to St. Paul. It was a short vacation but we crammed lots into our time and definitely made some great memories from our second trip to Duluth. I can't wait to make it back there again soon! Looks like a great birthday weekend! And that cold in the summer? It's over 90 degrees every day here in Georgia, haha.